I thought I’d make the most of what I hoped was the last of the cooler weather and cook up an osso buco. Our butcher sells the pieces of shank quite cheaply and I figured that the leftovers would make a good freezer standby. I started to look around for recipes and turned first to The Silver Spoon , the Bible of Italian cooking. This is a very practical book: the recipes are usually brief (sometimes to the point of appearing boring) and I view it as much more of a reference manual than a step by step instruction guide. In this case, it offered two variations on a theme: Milanese osso buco and veal osso buco with peas. Well, no chance of me making anything with peas! I ended up combining the two recipes to come up with my own version. Melt some butter and olive oil in a large pan and sauté off a finely chopped onion, two diced carrots and one large clove of garlic (also finely chopped). With the heat medium high, add three pieces of shank (around 1kg worth), dredged in flour, and fry until they start to take on some colour. Pour in a generous splash of red wine and continue to cook until the wine all but evaporates. Then add 150mL of good quality beef stock, a 400g tin of crushed tomatoes and large slices on the rind of half a lemon. Reduce the heat, cover with a lid and cook slowly until the meat begins too fall apart (let’s say a good hour or two – this is not a dish for those in a hurry). Once the meat is tender, you may wish to cook for a little longer with the lid off to thicken the gravy. When you’re ready to serve, stir through a simple gremolata made from the grated rind of half a lemon and a generous half cup or so of chopped parsley. 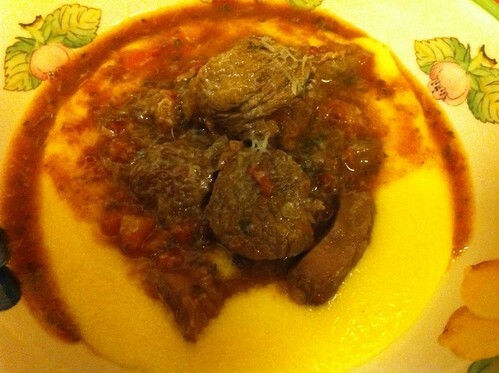 Serve with your favourite starchy side … we had polenta, made with cream, butter and parmesan cheese (what was in the fridge), but mashed potatoes, risotto or even pasta would do just as well.